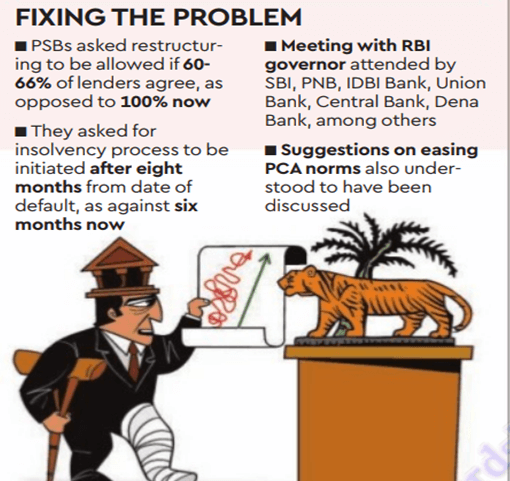 Banks have shown interest In keeping the NPAs (Non-performing Assets) out of court. This means RBI should initiate actions to revise their Circular dated 12th Feb 2018 which relates to out of court resolutions. In a recent meeting with the Governor, the Bank executives suggested that the 100% vote needed to approve the plan on a restructuring of a loan to prevent an account being referred to initiate insolvency process be reduced to 60-66%. Further, Banks have requested for an eight months, instead of the current 180 days to try and try a Bad loan before it is referred to the National Company Law Tribunal (NCLT) under the Insolvency and Bankruptcy Code (IBC). This relates to accounts worth Rs. 2000 crore or more. As of now all lenders in a consortium should agree to a restructuring plan if an account is required to be kept away from the insolvency process. The said circular also had withdrawn all existing debt restructuring schemes for stressed accounts.